The New War, the Forever War, and a World Beyond War - World Beyond War . . . The following is an assessment of the current ISIS crisis. The statement examines: (1) the social context of the destructive violence in Syria and Iraq — where we are; (2) viable nonviolent alternatives — what should be done; and (3) opportunities for civil society to advocate and push for those alternatives — how we can make it happen. The alternatives and pathways toward achieving those are not only preferable from a perspective of humanity, but proven to be more effective. Graphic beheadings and other quite real stories of horrors committed by a new enemy — ISIS — have led to increased support for U.S. involvement. But a war on ISIS will make things worse for all concerned, following, as it does, a pattern of counterproductive action. Through the course of the so-called global war on terrorism, terrorism has been on the rise. 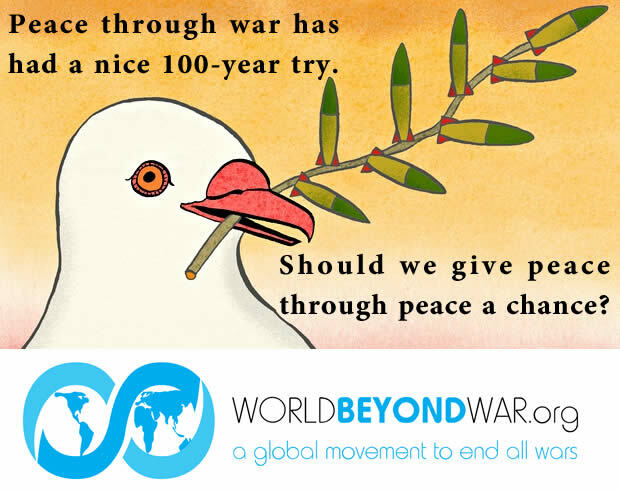 Nonviolent alternatives to war are abundant, morally superior, and strategically more effective. Some but not all are: apologies for past actions; arms embargoes; a Marshall Plan of restitution for the Middle East; meaningful diplomacy; appropriate conflict resolution responses to terrorism; addressing the immediate crisis with humanitarian intervention; redirecting our energies at home; supporting peace journalism; working through the United Nations; and de-authorizing the war on terror. No solution by itself will bring peace to the region. Many solutions together can create a strong web of peacebuilding fabric superior to continued war. We cannot expect to make all of the above happen immediately. But by working toward those ends we can achieve the best results as quickly and as lastingly as possible. We need teach-ins, communications, and education of all sorts. People should know enough facts to give their positions context. We need demonstrations, rallies, sit-ins, town forums, disruptions, and media productions. And if we make this a part of ending the whole institution of war, rather than just a particular war, we may move closer to not having to keep opposing new wars all the time. Public opinion on wars in the United States follows a tragic pattern, soaring — sometimes to over a majority — in support of a war when it’s new, and then predictably sinking. During most of the 2003-2011 U.S. war on Iraq, a majority in the U.S. said the war should never have been begun. In 2013, public opinion and pressure played a prominent role in preventing the launching of a new U.S. war on Syria. In February 2014, the U.S. Senate rejected legislation that would have moved the United States closer to war with Iran. On July 25, 2014, with the U.S. public against a new U.S. war in Iraq, the House of Representatives passed a resolution that would have required the President to obtain authorization before launching a war (just as the Constitution already requires) had the Senate passed the resolution too. At that distant date of a few months back, it was still possible to talk about an “antiwar mood,” to applaud the Catholic peace group Pax Christi for its historic decision to reject “just war” theory, to celebrate the state of Connecticut’s creation of a commission to transition to peaceful industries, to point to public support for taxing the rich and cutting the military as the top two solutions whenever the U.S. government and media discussed a debt crisis, and to envision a less-militarized future approaching. But support for U.S. drone strikes remained relatively high, opposition to Israel’s war on Gaza with U.S. weapons remained weak (and in Congress and the White House virtually nonexistent), the CIA was arming Syrian rebels against the overwhelming preference of the U.S. public, and the proposed missile strikes into Syria had not been replaced with any significant effort to create an arms embargo, negotiate a ceasefire, provide major humanitarian aid, or otherwise reject a war-focused foreign policy and economic agenda that had merely been put on hold. Moreover, public opposition to war was weak and ill-informed. Most Americans lacked even a roughly accurate idea of the destruction their government had caused in Iraq, could not name the nations their government was striking with drones, didn’t study the evidence that their government had lied about chemical weapons attacks in Syria and threats to civilians in Libya, didn’t pay much attention to the human rights abuses or support for terrorism by U.S.-backed kings and dictators, and had been long trained to believe that violence arises out of the irrationality of foreigners and can be cured with greater violence. Support for a new war was driven by graphic beheadings and other quite real stories of horrors committed by a new enemy: ISIS. This support is as likely to be short-lived as support for other wars has been, barring some dramatic new motivation. And this support has been exaggerated. Pollsters ask whether something should be done and then simply assume that the something is violence. Or they ask whether this type of violence should be employed or that type of violence, never offering any nonviolent alternatives. So, other questions could produce other answers right now; time is likely to change the answers for the better; and education would accelerate that changing. Opposition to the horrors of ISIS makes perfect sense, but opposition to ISIS as a motivation for war lacks context in every way. U.S. allies in that region, including the Iraqi government and the so-called Syrian rebels, behead people, as do U.S. missiles. And ISIS isn’t such a new enemy after all, including as it does Iraqis thrown out of work by the U.S. disbanding of the Iraqi military, and Iraqis brutalized for years in U.S. prison camps. The United States and its junior partners destroyed Iraq, leaving behind sectarian division, poverty, desperation, and an illegitimate government in Baghdad that did not represent Sunnis or other groups. Then the U.S. armed and trained ISIS and allied groups in Syria, while continuing to prop up the Baghdad government, providing Hellfire missiles with which to attack Iraqis in Fallujah and elsewhere. Even opponents of the Saddam Hussein government (which was also put into power by the United States) say there could have been no ISIS had the United States not attacked and destroyed Iraq. Additional context is provided by the manner in which the U.S. occupation of Iraq temporarily ended in 2011. President Obama withdrew U.S. troops from Iraq when he couldn’t get the Iraqi government to give them immunity for any crimes they might commit. He has now obtained that immunity and sent troops back in. ISIS has religious adherents but also opportunistic supporters who see it as the force resisting an unwanted rule from Baghdad and who increasingly see it as resisting the United States. That’s how ISIS wants to be seen. U.S. wars have made the United States so hated in that part of the world, that ISIS openly encouraged U.S. attacks in an hour-long film, provoked them with the beheading videos, and has seen huge recruitment gains since the U.S. began attacking it. ISIS is in possession of U.S. weaponry provided directly to it in Syria and seized from, and even provided by the Iraqi government. At last count by the U.S. government, 79% of weapons transferred to Middle Eastern governments come from the United States, not counting transfers to groups like ISIS, and not counting weapons in the possession of the United States. So, the first thing to do differently going forward: stop bombing nations into ruins, and stop shipping weapons into the area you’ve left in chaos. Libya is of course another example of the disasters that U.S. wars leave behind them — a war in which U.S. weapons were used on both sides, and a war launched on the pretext of a claim well documented to have been false that Gadaffi was threatening to massacre civilians. So, here’s the next thing to do: be very skeptical of humanitarian claims. The U.S. bombing around Erbil to protect Kurdish and U.S. oil interests was initially justified as bombing to protect people on a mountain. But most of those people on the mountain were in no need of rescue, and that justification has now been set aside, just as Benghazi was. A war on ISIS isn’t a bad idea because the suffering of ISIS’s victims is not our problem. Of course it’s our problem. We are human beings who care about each other. A war on ISIS is a bad idea because it is not only counterproductive, but will make things worse. Through the course of the so-called global war on terrorism, terrorism has been on the rise. This was predictable and predicted. The wars on Iraq and Afghanistan, and the abuses of prisoners during them, became major recruiting tools for anti-U.S. terrorism. In 2006, U.S. intelligence agencies produced a National Intelligence Estimate that reached just that conclusion. Drone strikes have increased terrorism and anti-Americanism in places like Yemen. The new U.S. attacks on ISIS have already killed many civilians. “For every innocent person you kill, you create 10 new enemies,” according to General Stanley McChrystal. The White House has announced that strict standards for avoiding large numbers of civilian deaths do not apply to its latest war. It is tearing down the rule of law, among other things. Without Congressional authorization, President Obama is violating the U.S. Constitution, and his earlier professed belief. “The President does not have power under the Constitution to unilaterally authorize a military attack in a situation that does not involve stopping an actual or imminent threat to the nation,” said Senator Barack Obama quite accurately. With a Congressional authorization, this war would still violate the U.N. Charter and the Kellogg-Briand Pact, which are the supreme law of the land under Article VI of the U.S. Constitution. The British Parliament voted to approve assistance in attacking Iraq, but not Syria — the latter being too clearly illegal for their taste. The White House has refused to estimate the duration or the cost of this war. There is every reason to assume that conditions on the ground will worsen. So only public pressure, not some sort of victory, will end the war. In fact, military victories are almost unheard of in this era. The RAND corporation studied how terrorist groups come to an end, and found that 83% are ended through politics or policing, only 7% through war. This may be why President Obama keeps saying, quite accurately, “There is no military solution,” while pursuing a military solution. So what should be done and how can we make it happen? Adopt a new approach toward the world: Apologize for brutalizing the leader of ISIS in a prison camp and to every other prisoner victimized under U.S. occupation. Apologize for destroying the nation of Iraq and to every family there. Apologize for arming the region and its kings and dictators, for past support for the Syrian government, and for the U.S. role in the Syrian war. Cease to support abusive governments in Iraq, Israel, Egypt, Jordan, Bahrain, Saudi Arabia, etc. Pursue an arms embargo: Announce a commitment not to provide weapons to Iraq or Syria or Israel or Jordan or Egypt or Bahrain or any other nation or ISIS or any other group, and to begin withdrawing U.S. troops from foreign territories and seas, including Afghanistan. (The U.S. Coast Guard in the Persian Gulf has clearly forgotten where the coast of the U.S. is!) Cut off the 79% of weapons that flow to the Middle East from the United States. Urge Russia, China, European nations, and others to cease shipping any weapons to the Middle East. Open negotiations for a nuclear, biological, and chemical weapons free region, to include the elimination of those weapons by Israel. Create a Marshall Plan of restitution to the entire Middle East. Deliver aid (not “military aid” but actual aid, food, medicine) to the entire nations of Iraq and Syria and their neighbors. This can generate sympathy in the population supportive of terrorists. This can be done on a massive scale for less cost than continuing to shoot $2 million missiles at the problem. Announce a commitment to invest heavily in solar, wind, and other green energy and to provide the same to democratic representative governments. Begin providing Iran with free wind and solar technologies — at much lower cost, of course, than what it is costing the U.S. and Israel to threaten Iran over a nonexistent nuclear weapons program. End economic sanctions. Give real diplomacy a chance: Send diplomats to Baghdad and Damascus to negotiate aid and to encourage serious reforms. Open negotiations that include Iran and Russia. Use the mechanisms provided by the United Nations constructively. The political problems in the region require political solutions. Employ peaceful means to pursue representative governments respectful of human rights, regardless of the consequences for U.S. oil corporations or any other influential profiteers. Propose the creation of truth and reconciliation commissions. Allow for citizen diplomacy efforts. Apply an appropriate conflict resolution response to terrorism by creating a multi-layered policy framework. (1) Prevention by reducing proneness to terrorism; (2) persuasion by reducing motivation and recruitment; (3) denial by reducing vulnerability and defeating hardliners; (4) coordination by maximizing international efforts. Dissolve terrorism at its roots. It is proven that civilian-based nonviolent forces can produce decisive change in societies, consequently reducing the demand for terrorism as a form of struggle, even driving a wedge between militants and their sympathizers. We need engagement through strategic contact, consultation and dialog rather than military force. Sustainable peacebuilding processes require the engagement of multiple stakeholders from multiple sectors of societies affected by violent conflict. Strengthening the civil society in the conflict zone will diminish the support base for terrorist groups. Responding with more violence is the victory which extremists seek. Deliberative dialogue inclusive of all views assists in understanding the sources of violence; addressing them through nonviolent strategies and creating conditions for sustainable peace will drive a wedge between militants and their sympathizers. Address the immediate crisis with a firm but caring humanitarian intervention: Send journalists, aid workers, international nonviolent peaceworkers, human shields, and negotiators into crisis zones, understanding that this means risking lives, but fewer lives than further militarization risks. Empower people with agricultural assistance, education, cameras, and internet access. Redirect our energies at home: Launch a communications campaign in the United States to replace military recruitment campaigns, focused on building sympathy and desire to serve as critical aid workers, persuading doctors and engineers to volunteer their time to travel to and visit these areas of crisis. At the same time, make economic transition from war to peace industries in the United States a collective public project of top priority. Stop going rogue: Work through the United Nations on all of the above. Adhere to international law, more specifically the UN Charter and Kellogg-Briand Pact. Sign the United States on to the International Criminal Court and voluntarily propose the prosecution of top U.S. officials of this and the preceding regimes for their crimes. De-authorize the war on terror (Authorization For Use of Military Force) as a “forever war authorization” — The AUMF can be challenged by taking partial but important steps. Those include reining in the drone warfare program and increasing government accountability. These steps have broad support among human rights and legal rights groups. Once a war is well underway and a debate is framed around how many more months it should go on, and the reality on the ground is predictably worsening, and “support the troops” propaganda is insisting that the war go on for the supposed benefit of the troops killing, dying, and committing suicide in it, the problem of how to end it is likely to loom much larger than if the popular position of “No War, Nonviolence Instead” has been well-articulated and defended. A demand is going to be heard for “no ground troops.” This should not be the focus of a peace movement. For one thing there already are some 1,600 U.S. ground troops in Iraq. They’re labeled “advisors” as are the 26 Canadians who just joined them. But nobody actually believes 1,626 people are giving advice. Another 2,300 troops will be deployed as a Middle East Marine Corps task force. By demanding “No Ground Troops” while accepting the pretense that they aren’t there now, we can actually give our stamp of approval to any ground troop labeled something else. In addition, a war dominated by air strikes is likely to kill more people, not fewer people, than a ground war. This is an opportunity to inform our neighbors who may be unaware that these wars are one-sided slaughters killing mostly people who live where they’re fought, and killing mostly civilians. Once we’ve acknowledged that reality, how can we continue with cries of “No ground troops” rather than “No war”? We need teach-ins, communications, and education of all sorts. People should know that beheading victim James Foley was opposed to war. People should know that ISIS gives George W. Bush credit in their film for being right about the need for war and pushes for greater warmaking against them by the United States. People should understand that ISIS promotes martyrdom as the highest goal, and that bombing ISIS strengthens it. We need demonstrations, rallies, sit-ins, town forums, disruptions, and media productions. Our message to people is: get active and engaged in what we’re doing; you’ll be surprised how this can be turned around. And if we make this a part of ending the whole institution of war, rather than just a particular war, we may move closer to not having to keep opposing new wars all the time. 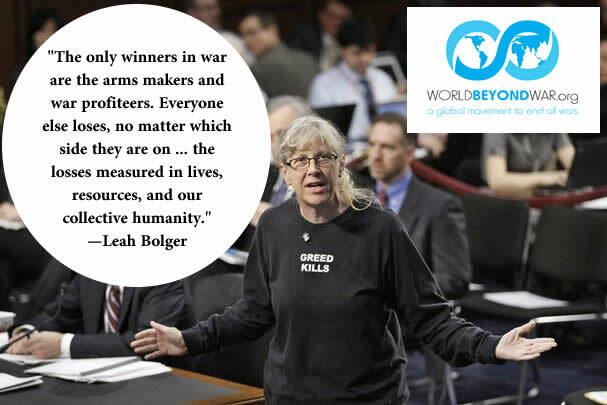 Our message to Congress members is: publicly pressure Speaker Boehner and Senator Reid to get back to work and vote to halt this war, or do not expect our votes to keep you in office for another term. Our message to the President is: now would be a good time to end the mind-set that gets us into wars, as you said you wanted to do. Is this really what you want to be remembered for? Our message to the United Nations is: the U.S. government is in blatant violation of the U.N. Charter. You must hold the United States accountable. 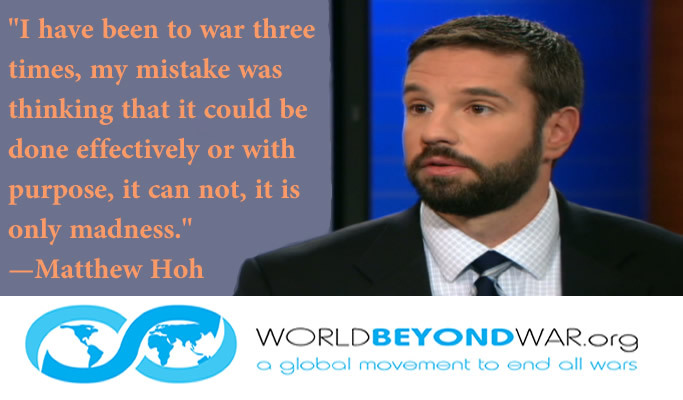 Our message to all parties is: war has no justification and no benefit, now or ever. It is immoral, makes us less safe, threatens our environment, erodes liberties, impoverishes us, and takes $2 trillion a year away from where it could do a world of good. The atrocities committed by ISIS are rightfully condemned. The threat ISIS poses is considered exaggerated. According to the Global Terrorism Index by the Institute for Economics and Peace, the number of terrorist incidents has increased virtually every year since 9/11. The Kellogg–Briand Pact is a 1928 international agreement in which signatory states promised not to use war to resolve “disputes or conflicts of whatever nature or of whatever origin they may be, which may arise among them.” For an in-depth exploration see David Swanson’s When the World Outlawed War (2011). 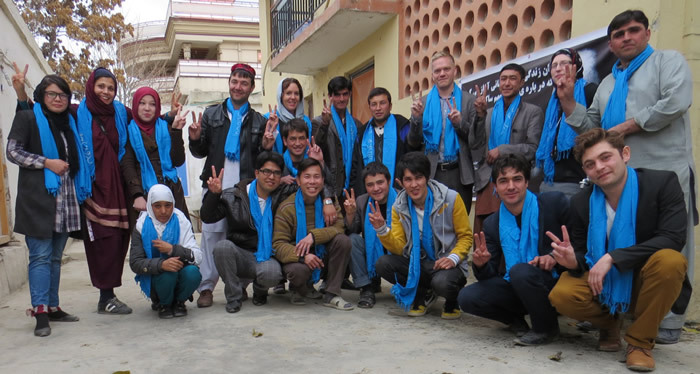 Political apologies are considered part of a complex peacebuilding process in conjunction with other conflict transformation techniques. See a summary of Apologia Politica: States and their apologies by proxy. UN Secretary General Ban Ki Moon, for example, urged the Security Council to impose an arms embargo into Syria. Outlined thoroughly by Hardy Merriman and Jack DuVall, experts from the International Center on Nonviolent Conflict. Have you considered that the war on terror may be a method whose purpose is to create terrorists? The true terrorist threat to Americans comes from the IRS, the FBI, the CIA, the NSA, the TSA, homeland security, and local law enforcement. The fear of terrorism is pushed at us daily, relentlessly, from the white house, the congress, and endlessly from the monster media organizations. I believe that terrorism is a replacement for the big bad soviet union. When the almighty Ronald Reagan foolishly forced the Soviets out of the cold war the masters of the universe in the military industrial finance cabal quickly realized the potential disaster not having an enemy would bring about. To avoid the inevitable slashing of the budget they set about designing the perfect enemy. Trouble is that the true threat is so minuscule no one would believe it. So for years they have been manufacturing as big a threat as possible. The media has really been the saving grace because real actual terrorists are far and few with many if not most provided by the CIA. Even the death and destruction of an entire nation or two or three have not spawned enough enemy to shake a stick at. In fact the average American stands more of a chance of being killed “while in custody” of local law enforcement, or of participating in a demonstration, or of taking a video of police abuse than of any terrorist threat. It is all a really big scam and I don’t understand how you can’t see it! I once wrote a comment on Facebook that “War is Terrorism”. An innocent, truthful, insightful, open minded, open hearted, educated, well traveled, morally correct, morally conscious statement. At the time, I really thought that, as I had become more and more aware of the reality behind this statement, every other of my fellow American people had as well. 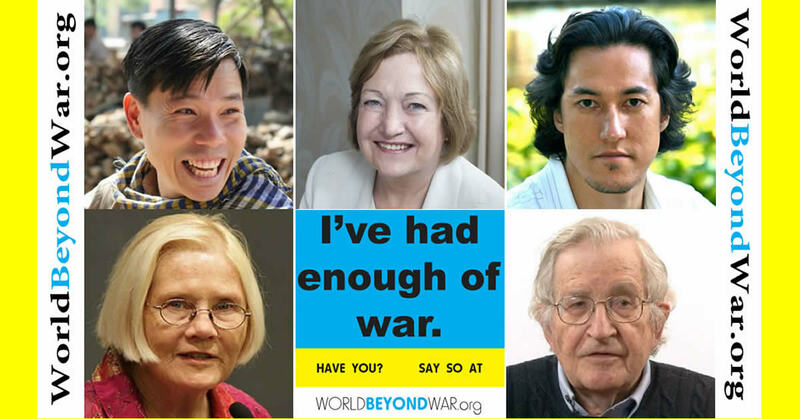 I thought perhaps they all had achieved the same level of cultured, enlightened, inner peace that defies the lack of outer peace of our nation, which fell to 110th in Global peace rating over the past 12+ years of perpetual war. but I was wrong. Not about making the statement, but about others also having been able to let go of our supremacy extremacy act. It hurt foremost those I love the most, and I am not “sorry”, as I have nothing to feel sorry about. I am only sorry for them, that they had not broadened their horizons enough to see the fact that I, not they, “support the troops”, in that I realize these girls and boys are victims not “victors”. The only anger I harbor is a healthy sort, that my beautiful family who are as educated, successful and amazing as I, could have been hoodwinked into the unsustainable myth that USA’s wars “serve” our nation, somehow “protect our way of life”. Sad indeed. I agree with Klaus, it is a scam. It’s perfect for the whole bankster/oil/weapons scheme because the war on terror never has to end. Sept 11 was the opening salvo, the ultimate false flag that enabled most all rights to be violated/eliminated as we switched over to a massive surveillance police state. If it wasn’t a false flag it certainly served the “right” purposes. As evidence of this look at the countries we bombed after 911 and who our allies became. Was Saudi Arabia ever bombed despite it’s involvement? Nope, we joined forces with them to overthrow a bunch of secular states that had nothing to do with 911. A big problem is that after WWII the elites and our economy became dependent upon the defense industry. Very few legislators including Bernie Sanders want to speak out or not fund it – no matter how idiotically insane it is. 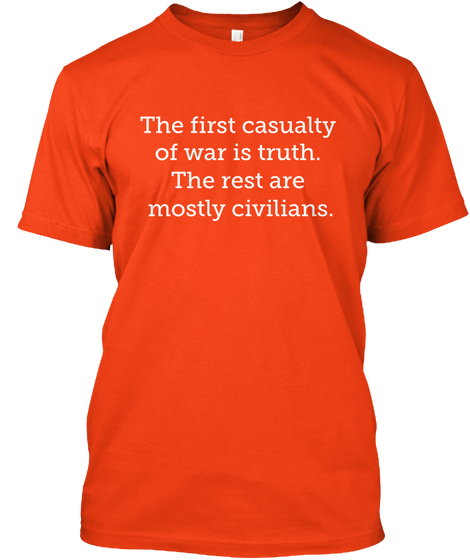 As previous commenter Klaus Pfeiffer noted, war is very profitable. Defunding war, however, is not easy. Could we just continuously lower the salaries of soldiers and officers and Pentagon higherups until they are the lowest paid workers on the national pay scale? and make the Secretary of Defense a volunteer cabinet position? The crux of the problem, it seems to me (besides the elephant in the closet we call capitalism, which promotes greed and imperialism) is that the USA and Big Oil are one and the same, and hav been for many decades. The Pentagon is where the work is done. Protesting there is analogous to protesting at a large factory in a undeveloped world where clothes are made from skins of animals on the endangered species list. All well and good, but better to protest at the headquarters of the company in the developed world that is profiting from those dead animals. To be more accurate, im suggesting that the USA government in all its three-letter manifestations is simply the employee of Big Oil and has been for quite some time. A problem i hav is that there are multiple oil conglomerates headquartered in the USA that seem to be equally evil, tho i suspect their is plenty of murderous infighting among them and only one of them is the top dog calling the shots at any one time. Generally, i agree with previous commenter Klaus Pfeiffer–to get to the root of our International problems, we hav to follow the money. And the money leads us to Big Oil, who is leading us to irreversible climate change. We must deal directly with Big Oil, not their US Government lackey. We must learn which oil conglomerate has hegemony and solicit the assistance of the other oil conglomerates to bring the big one to the table. Otherwise, when we bring down the big one, the others will jump in to fill the vacuum. Oil is dirty business (profiting from the decomposed bones of our ancestors). We must roll up our sleeves and get dirty. Peace is dirty business. Very dirty. We must deal directly with the least savory, most greedy amongst us, and find them a decent job where they cant continue to hurt other people or themselves. I’m not suggesting that this is possible by the means which u propose. The alternative in the near future, however, is irreversible climate change. So big change is in the air, one way or the other. I applaud ur efforts, and support u. Thanks again for speaking out. Before giving uncritical support to the White Helmets, who are less a genuine civil ‘defense’ group, more a USAID funded propaganda outfit started by a British army ‘Intelligence’ spook (James Le Mesurier) (also financed by several warmonger European governments). They operate, only in the ‘rebel’ held areas, and their real mission is to advertise ‘humanitarian’ war and spread false propaganda about alleged Russian and Syrian bombings of hospitals etc, through their Twitter accounts, and via the, so-called, ‘Syrian Observatory on Human Rights’ (who used to be one person, living in a council house in Coventry, England, but is now, apparently, based in London. The aim is to falsely justify a full scale US-UK invasion of Syria, starting with a ‘no-fly-zone’, which would involve shooting down Syrian and Russian aircraft and start a nuclear war . When Einstein realized the power of E=mc2 to release the energy of the sun, he accurately predicted it would be a matter of time before tribes create and unleash weapons with ultimate destructive power to create human catastrophe. He told us we can prevent becoming the first species to deliberately create our own extinction: We must teach ourselves a newer way of thinking. Einstin’s solution is available at http://www.peace.academy and http://www.worldpeace.academy. 7 simple word changes and two love-creation skills create a newer way of thinking that leads to cooperation for mutual benefit instead of competition to dominate others. All content is forever FREE to everyone, everywhere, any time via the Internet. Thank you for the comment space. Only Syria: a couple rarely mentioned issues can point toward peace. Open truth can lead. A Syrian-American friend comes from Syrian Christians, part of the Assad’s coalition. His relatives know that if they ever stand down, they will be slaughtered. Yes the atrocities are real, an all too successful part of the campaign to keep the rest of Syria under their control. And they have made out like bandits. The hatred is high. 2nd, Syria has been a mostly closed economy. Western business interests have fueled the rebels and lobbied our governments for military – that ancient story. Likely Russian business interests are as large a factor for Putin as global prestige. So a cooling off period with visible movement toward democracy should be negotiable. Start with the ‘counties’ which I understand traditionally center on towns, and have been mostly Assad appointees. Allowing a full term before their 11 state elections renews democratic skills. Finally national elections, which will likely end the Assad’s power, but not necessarily. I prefer dispersed elections, top down to resolve hierarchy, so top elections precede next level. Yet overall the negotiations will determine what schedule. Negotiations will also map how open and on what timetable the economy will open to western and Russian influence. Syria mostly has relied on import/export revenue. Whether currently wealthy families can show enough ‘good works’ to ameliorate the hatred, or whether a wealth and income tax, with write-offs for charity, is needed, can likely be mapped in the negotiations. Likely much of Syria’s wealth has followed successful refugees but the majority of those families cannot stand down. Like South Africa, restorative justice councils are needed. Finally negotiations to cease fire, toward police and military unification, and eventual demilitarization can probably follow the current negotiations. Separate votes can be mapped if all goes well, or not. Initial aid and refugee return are keys. Cool off, democracy, economy, charity, peace and truth is a long list to negotiate. All of what you say is true, I’m just adding detail, and only on Syria, for now.